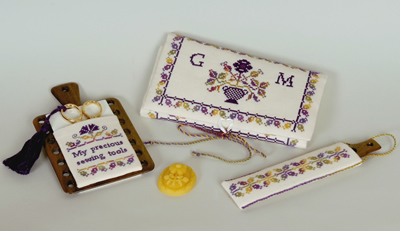 This sewing set is composed by three pieces: a huswif like etui (with inside pocket, needle page, and four heart shaped Mother of pearl rings to hold threads), a ruler etui and a hornbook-scissors keeper. This model is stitched with variegated beautiful hand dyed silk threads by The Thread Gatherer. My friend Cecelia has even created for me the Giulia’s Dream thread! The chart for this model and the complete stitching and finishing kit are available only through the Swan Sampler Guild of Salt Lake City. The mission or this very active Guild is to aid in the preservation of samplers and the art of sampler-making. Through special projects, classes by talented instructors, and the support of sponsors, the Swans are able to donate proceeds toward the literal preservation of these unique textiles, and therefore, the unique histories associated with them. If you’re interested in being a part of this mission, you can check out the website Membership page of the Swan Sampler Guild. Inside the website for you will find a lot or resources, beautiful articles and kits. I am very proud to be a member of this prestigious guild and for this reason my Giulia’s Sewing Set is dedicated to the Swans and released only by the Guild. 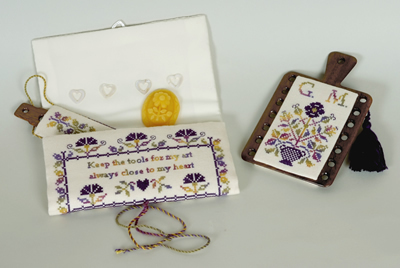 Finishing kit: ecru silk finishing fabric, ecru wool felt, interfacing, Iron-on adhesive, Skirtex, Hobbs Heirloom or similar cotton batting, five Mother Of Pearl heart rings by Kelmscott Designs , ecru polyester sewing thread, acid-free Elmer’s stick glue, Tacky Glue. Price please ask the Swan Sampler Guild.